No club shipping charges AND no shipping charges on club reorders! Experience a New Level of Opulence! For those who want to experience only the rarest and most exceptional wines found in such limited quantities that we must limit membership to just 100 people. Each month you'll receive two different (all red) super-premium wines. Shipping is always FREE! Join now and you'll receive your first shipment 50% off the regular price! Hurry, this is a limited-time offer. 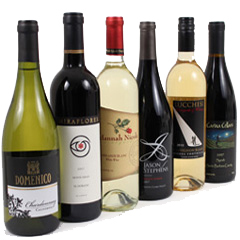 Savor two different premium red wines from California, Oregon or Washington in each shipment, along with an exciting international red wine from Italy, France, Spain, Australia and beyond. Also included will be one bottle of crisp, white wine, either domestic or international. Our colorful newsletter with detailed wine information and perfectly paired wine recipes accompanies each shipment. Shipping is always FREE! 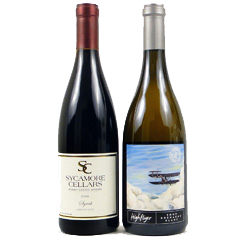 Every month, two premium wines from California's famous appellations such as Napa and Sonoma along with the best of Oregon and Washington wines are hand selected. A wide variety of hard-to-find vintage wines, reserve level wines and limited edition wines are sure to impress and please you. Shipping is always FREE! Do you like to try a wide variety of great wines? If so, this Wine Club is for you! 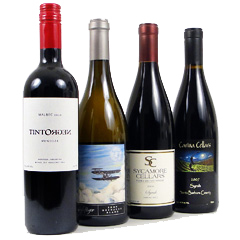 Every three months you will receive six exceptional wines from California, Oregon, Washington and selected imports. Shipping is always FREE!